Here I have mixed a little Permanent Sap Green, a touch of New Gamboge and a touch of Burnt Sienna. This creates a nice warm, earthy green. You can use Earthen Green, it would work just as well. 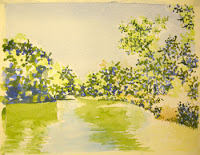 I applied the Brush Dance strokes of this color mixture to the trees. The applications of pigment on the trees so far have all been a foundation for the details to come. 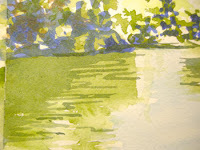 I have applied the same mixture used above, to add some depth to the reflections in the water. Again, keep those brush strokes horizontal. The thoughtfulness with which you apply your brushwork will determine the final outcome of your painting. 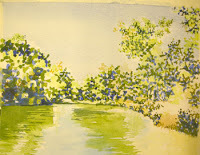 If you like to paint loose, then use loose brushwork. If you want to strive for realism, then you must fine-tune your eyes to the detailed shapes of the colors and values within your picture plane. Bottom, right is a detail of the horizontal brushwork. You really don't need to be "fussy", but you need to pay attention to the overall shape and direction of any washes or line work you apply. Would you like to paint along with this project? Visit my etsy site and choose the Online Class item. For $5.00 you can get an email with the reference photo and a drawing, ready to transfer to your paper! Then just visit daily to see what steps and colors to use next.